The Cameron Highlands is Malaysia’s most extensive hill station. It occupies an area of 712 square kilometres (275 sq mi). To the north, its boundary touches that of Kelantan to the west, it shares part of its border with Perak. The mean annual temperature of the retreat is about 18 °C (64 °F). During the day, the temperature seldom rises over 25 °C (77 °F); at night, it can drop to as low as 9 °C (48 °F) at the higher reaches. Cameron Bharat Tea Estate - The brand of the tea marketed by the company is called Cameron Valley Tea. Take a cup of tea, some scones and other snacks while enjoying the fantastic view of the tea plantations. 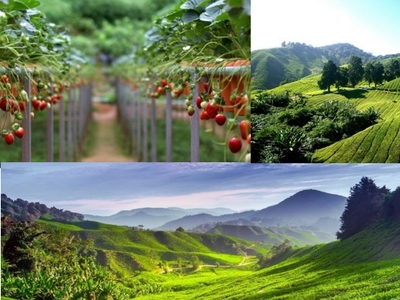 Big Red Strawbery Farm - is a must visit for all visitors to Cameron Highlands. Located within walking distance from the Brinchang town, it's an ideal place to visit come rain or shine. The Time Tunnel - is billed as "The Local Museum", the first memorabilia museum in Malaysia. Opened since February 2007, it's the brainchild of 45-year-old See Kok Shan, an avid collector who believes that all that's old is gold. The Lavendar Garden – is the latest addition to the multitude of Farm In Cameron Highland. As we drive along the road , it is impossible to miss this expressive sea of flowers and possibly the most massive one too in Cameron Highland. Gunung Brinchang - is the second highest mountain in Cameron Highlands (after Gunung Irau) at 2000 meters above sea level. The highest tarmac road in Malaysia leads up to the top, but its condition may be haphazard due to elements (repairs are carried out from time to time).